The yellow Tonu named Min looked up at his brother, a Christmas Bori named Apoc. He nodded grimly. He was ready. The two pets were preparing for something very important. If they went about it the wrong way, the whole thing could go wrong. They needed to ask their sibling Jay for a favour. Apoc put on a big smile and walked towards Jay. Jay was a sponge Blumaroo who didn’t really like Apoc and Min. However Apoc felt confident Jay would grant them a favour. After all, they hadn’t put Spyders in his bed in over a week. This was a new record for them. “Hey there, sis!” Apoc greeted Jay warmly. Jay turned an ugly colour. Apoc gulped. He had made his first mistake. Jay spent a lot of time at the lab ray. This meant that it was sometimes hard to tell which gender he was, especially if he had recently changed species. Apoc smiled and tried again. “Hey there, bro!” Apoc greeted Jay warmly. “What do you want?” the Blumaroo grumbled. “Well,” Apoc began. “Min and I wanted to visit the secret laboratory. Could you tell us the way there?” He batted his eyelashes. Min gave a broad grin. At this point their argument was interrupted by MI, Apoc’s owner. MI gave Jay a sharp glare. The Blumaroo knew he had lost this argument. “Fine!” Jay threw the completed map in Apoc’s direction. He also threw a small rectangular piece of paper at him. “What’s this?” Apoc asked, examining the piece of paper. Apoc examined the card. His owner’s name, his name, and the names of his siblings were printed on it. Min muttered something about paranoia. “Now listen!” Jay leaned in towards Apoc. “That card is the one thing that lets me get to the lab ray. Without it, I will never become a Koi again. So if you lose it, that’s really bad news for you. Got it?” Their noses were almost touching each other. “Got it!” said Apoc meekly. 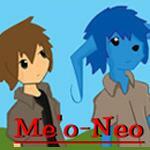 Apoc and Min ran out of the neohome. As they ran down the street, Min turned to Apoc. Min blinked. This was confusing. So the pets were off. Min was gazing at the sky, and Apoc was tossing Jay’s card up in the air. Min turned to his brother. “Jay trusted you with that. Shouldn’t you be more careful?” Apoc’s eyes widened at the accusation. Apoc held the card away from Min. A passing Ogrin turned to them. “I’m carrying a very special card! It lets me gain access to the lab ray!” Min was making frantic hand motions behind the Ogrin, but Apoc wasn’t paying any attention. “It’s extremely expensive, and very important to me!” Apoc paused. The Ogrin’s eyes had suddenly widened and he was staring at something behind Apoc. He gave a small scream and ran away. Apoc felt pleased with himself. After all, if he was going to take over Neopia he needed to look frightening. However then he heard a noise behind him. Apoc turned around and found himself face to face with the Pant Devil. His reflexes were immediate. He shoved the nine laboratory map pieces into his scarf. They just barely fit. However while he did this, he failed to realize the Pant Devil had his eyes on something else. He didn’t realize it until he felt a pull, and the card was yanked from his paw. “Don’t worry!” he laughed. “I have a foolproof fighting strategy!” He took a deep breath. Then he ran away as fast as he could, giggling madly. Apoc and Min stared in shock. He really was fast. “So I guess that answers your question!” Apoc turned to Min and to his horror saw Jay walking up to them. “Hey guys!” he waved. “I’m going to come to the lab ray with you, OK? I haven’t gone yet today!” Apoc gulped. Even if they were able to get the card back before Jay realized what had happened, Jay would almost certainly try to stop their evil plan. So he decided to use the exact same style of combat the Pant Devil used thirty seconds ago, and ran off shrieking wildly. Min shrugged and followed suit. When they were a safe distance away, Apoc turned to Min. Apoc’s eyes widened in agreement. He stared at his brother. Then a plan came to mind. “Leave him to me!” Apoc turned to the Blumaroo. Jay ran away screaming something about not wanting to be used as a mop. As they walked towards the Pant Devil, Min turned to Apoc. He calmly walked up to the Pant Devil and tapped him on the shoulder. The creature turned. “Oh really?” the Pant Devil grinned widely. Apoc shuddered. He really did have bad breath. “OH, GROSS!! !” screeched the Pant Devil. Running about ten times as fast as the previous time, the Pant Devil dropped the card, and ran off looking for soap. “Not quite!” came a loud voice. The two pets turned to see Jay frowning at them. With that, Jay ran off with the Pant Devil in hot pursuit. “Well Min, I think Jay learned a valuable lesson!” Apoc smiled.